What it does: Wear shades alone or layered together in different combinations. Crease- and fade-resistant. Ophthalmologist tested for even the most sensitive eyes and contact lens wearers. Mirrored compact with illustrated how-tos plus two sponge-tip applicators. 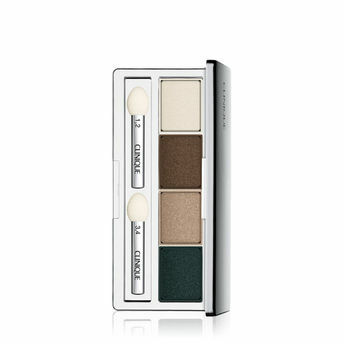 Long-wearing powder eye colour in a versatile palette. Explore the entire range of Eye Shadow available on Nykaa. Shop more Clinique products here.You can browse through the complete world of Clinique Eye Shadow .Alternatively, you can also find many more products from the Clinique All About Shadow Quad range.